As part of the many updates to Active Directory, one of the most interesting is virtualization safeguarding in Windows Server 2012. Active Directory Domain Controllers running Windows Server 2012 can now identify if they are virtualized and have been improperly restored or cloned (copied). Windows Server 2012 introduces a new feature called the VM Generation ID which is used to track the virtual machine (VM) on which the OS is running. When a new VM is created in a hypervisor that supports the feature (Hyper-V 2012 & VMWare vSphere 5.1), a VM Generation ID is created by the hypervisor and associated with the VM as the unique VM guest identifier. The VM Generation ID is a 128-bit cryptographically random integer that changes when the VM’s configuration file changes. The virtual machine’s BIOS provides the VM Generation ID to the OS in an 8-byte aligned buffer in guest RAM, ROM, or device memory space which can be queried via ACPI namspace with a compatible ID of “VM Gen Counter” (also a DOS Device Name of “VM_Gen_Counter”. When the generation ID changes, there is an ACPI Notify operation on the generation ID device ID device using notification code 0x80 (an ACPI GPE can triger this notification). Each Domain Controller has a unique identifier called the Invocation ID for the Active Directory database instance on that DC. When a DC is backed up and restored, the Invocation ID changes. Each DC tracks changes it makes to its local AD database, NTDS.dit, using an incremental counter called the Update Sequence Number (USN). Active Directory replication leverages a combination of the InvocationID and the USN in order to determine what data a DC requests from other DCs. The USN normally only increases in value; however, there are circumstances where a “USN rollback” occurs such as when a DC’s VM snapshot is restored. With a USN roollback, the DC is improperly restored to a point in time “rolling back” the USN to a previous value. The DC doesn’t have AD data that other DCs have and believe that it has (for more information, read my article on the subject: USN rollback). The new VM Generation ID protects against this scenario. At first boot-up, a virtualized Windows Server 2012 Domain Controller queries the hypervisor for the VM Generation ID and stores it in in the Active Directory database file (NTDS.dit). Each time the DC is rebooted, the VM’s current VM Generation ID is compared with the value in the DC’s NTDS.dit file (ms-DS-Generation-Id). If the values are different, the DC resets the invocation ID, discards the RID pool, and updates the value in the DC’s NTDS.dit file. The DC also non-authoritatively synchronizes the SYSVOL folder to ensure proper operation and replication. NOTE: The ms-DS-Generation-Id computer attribute does not replicate – to view a specific DC’s Generation ID, query for it on that DC. 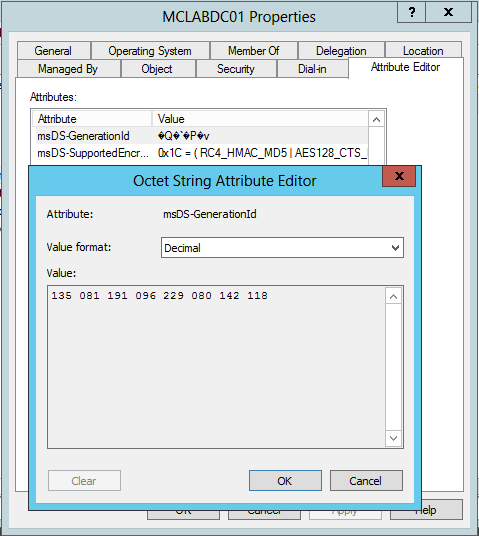 You may notice in the graphic above that when querying DC02 for DC01’s msds-generationid attribute value, it is blank. Since this value does not replicate, you have to query for the value on the DC that stores the value. This feature also provides the capability to clone (copy) Domain Controllers. Virtual machine starts executing a snapshot. Virtual machine is recovered from a backup. Virtual machine is failed over in a disaster recovery environment. Virtual machine is imported, copied, or cloned. Virtual machine’s configuration changes (depending on change). Virtual machine is moved from a hypervisor host not supporting VM Generation ID to one that does. Only Domain Controllers running Windows Server 2012 on a Hyper-V 2012 or VMWare vSphere 5.1 VM support this feature. * A restored domain controller must be able to contact a writable DC. If restored, a domain controller must have connectivity to a writable domain controller; a read-only domain controller cannot send the delta of updates. The topology is likely correct for this already, as a writable domain controller always needed a writable partner. However, if all writable domain controllers are restoring simultaneously, none of them can find a valid source. The same goes if the writable domain controllers are offline for maintenance or otherwise unreachable through the network. * All domain controllers in a domain must not be restored simultaneously. If all snapshots restore at once, Active Directory replication works normally but SYSVOL replication halts. The restore architecture of FRS and DFSR require setting their replica instance to non-authoritative sync mode. If all domain controllers restore at once, and each domain controller marks itself non-authoritative for SYSVOL, they all will then try to synchronize group policies and scripts from an authoritative partner; at that point, though, all partners are also non-authoritative. * Any changes originating from a restored domain controller that have not yet replicated outbound since the snapshot was taken are lost forever. Virtual environments present unique challenges to distributed workloads that depend upon a logical clock-based replication scheme. AD DS replication, for example, uses a monotonically increasing value (known as a USN or Update Sequence Number) assigned to transactions on each domain controller. Each domain controller’s database instance is also given an identity, known as an InvocationID. The InvocationID of a domain controller and its USN together serve as a unique identifier associated with every write-transaction performed on each domain controller and must be unique within the forest. How do these virtualization safeguards work? During domain controller installation, AD DS initially stores the VM GenerationID identifier as part of the msDS-GenerationID attribute on the domain controller’s computer object in its database (often referred to as the directory information tree, or DIT). The VM GenerationID is independently tracked by a Windows driver inside the virtual machine. When an administrator restores the virtual machine from a previous snapshot, the current value of the VM GenerationID from the virtual machine driver is compared against a value in the DIT. If the two values are different, the invocationID is reset and the RID pool discarded thereby preventing USN re-use. If the values are the same, the transaction is committed as normal. AD DS also compares the current value of the VM GenerationID from the virtual machine against the value in the DIT each time the domain controller is rebooted and, if different, it resets the invocationID, discards the RID pool and updates the DIT with the new value. It also non-authoritatively synchronizes the SYSVOL folder in order to complete safe restoration. This enables the safeguards to extend to the application of snapshots on VMs that were shutdown. These safeguards introduced in Windows Server 2012 enable AD DS administrators to benefit from the unique advantages of deploying and managing domain controllers in a virtualized environment. The following illustration shows how virtualization safeguards are applied when the same USN rollback is detected on a virtualized domain controller that runs Windows Server 2012 on a hypervisor that supports VM-GenerationID. In this case, when the hypervisor detects a change to VM-GenerationID value, virtualization safeguards are triggered, including the reset of the InvocationID for the virtualized DC (from A to B in the preceding example) and updating the VM-GenerationID value saved on the VM to match the new value (G2) stored by the hypervisor. The safeguards ensure that replication converges for both domain controllers. With Windows Server 2012, AD DS employs safeguards on virtual domain controllers hosted on VM-GenerationID aware hypervisors and ensures that the accidental application of snapshots or other such hypervisor-enabled mechanisms that could ‘rollback’ a virtual machine’s state does not disrupt the AD DS environment (by preventing replication problems such as a USN bubble or lingering objects). However, restoring a domain controller by applying a virtual machine snapshot is not recommended as an alternative mechanism to backing up a domain controller. It is recommended that you continue to use Windows Server Backup or other VSS-writer based backup solutions.